All three dimensions of the National Research Council’s Framework for K–12 Science Education integrated in every lesson. Triumph Learning, producer of critically acclaimed K-12 instructional materials and interactive digital tools, today announced the upcoming release of Buckle Down 3-D Science for the 21st Century. 3-D Science joins an award winning portfolio of K-12 supplemental products anchored around Triumph’s Coach series, which includes on-level, intervention, as well as practice and assessment solutions for K-12. 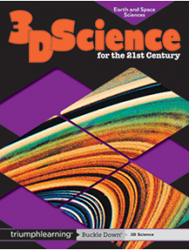 Each 3-D Science book covers essential topics ascribed by the NGSS, in physical, life, and earth science, as well as engineering. The 3-D Science series will be available for Grades 3-8 beginning this July, in time for back-to-school. Triumph Learning, LLC, is a leading educational content company and publisher of print and digital K-12 resources, standards-aligned instructional materials and effective literacy programs. Its state-customized and Common Core products have served more than 6 million students in 36,000 schools in 2013 and 2014. Triumph Learning offers unique student solutions, robust teacher support, and professional development opportunities. Triumph Learning is committed to serving all students with a mix of interactive digital tools and innovative student texts with products such as Coach, Buckle Down, and Coach Digital. For more information, visit http://www.triumphlearning.com.